Rust is a up-and-coming programming language, developed by the Mozilla Foundation, and is used in the Firefox rendering engine, as well as the Node Package Manager, amongst others. There is a lot to say about Rust; suffice it to say that it’s designed to be memory-safe, fast (think: C or better), it can compile to WebAssembly, and has been voted “most loved language” on StackOverflow in 2017 and 2018. As far as new-ish languages go, this is one to keep an eye on. This represents a bare-bones approach, but it would already be quite useful for simple command-line tools and bots. Because Rust compiles into stand-alone binaries, such tools are easy to run; no issues with Composer and PHP versions, node.js version/dependency hell, Python virtualenvs, etc. The next functionality to implement might include OAuth logins, and a SPARQL query wrapper. If you know Rust, and would like to play, the crate is called mediawiki, and the initial version is 0.1.0. The repository has two code examples to get you started. Ideas, improvements, and Pull Requests are always welcome! The Cleveland Museum of Art recently released 30,000 images of art under CC-Zero (~public domain). Some of the good people on Wikimedia Commons have begun uploading them there, to be used, amongst others, by Wikipedia and Wikidata. 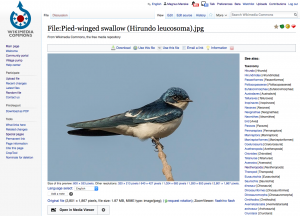 But how to find the relevant Wikipedia article (if there is one) or Wikidata item for such a picture? One way would be via titles, names etc. But the filenames are currently something like Clevelandart_12345.jpg, and while the title is in the wiki text, it is neither easily found, nor overly precise. But, thankfully, the uploader also includes the accession number (aka inventory number). That one is, in conjunction with the museum, a lot more precise, and it can be found in the rendered HTML reliably (to a degree). But who wants to go through 30K of files, extract the inventory numbers, and check if they are on, say, Wikidata? And what about other museums/GLAM institutions? That’s too big a task to do manually. So, I wrote some code. First, I need to get museums and their categories on Commons. But how to find them? Wikidata comes to the rescue, yielding (at the time of writing) 9,635 museums with a Commons category. That way, I can skip museum categories that do not have inventory numbers in their file descriptions. If one of them is updated with such numbers, I can always remove the entry that says “no inventory numbers”, thus forcing a re-index. My initial scan is now running, slowly filling the database. It will be run on a daily basis after that, just for categories that have inventory numbers, and new categories (as per Wikidata query above). That’s the first part. The second part is to match the files against Wikidata items. I have that as well, to a degree; I am using the collection and inventory number properties to identify a work of art. 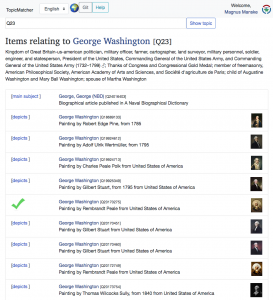 Initial tests did generate some matches, for example, this file was automatically added to this item on Wikidata. This automatic matching will run daily as well. A third part is possible, but not implemented yet. 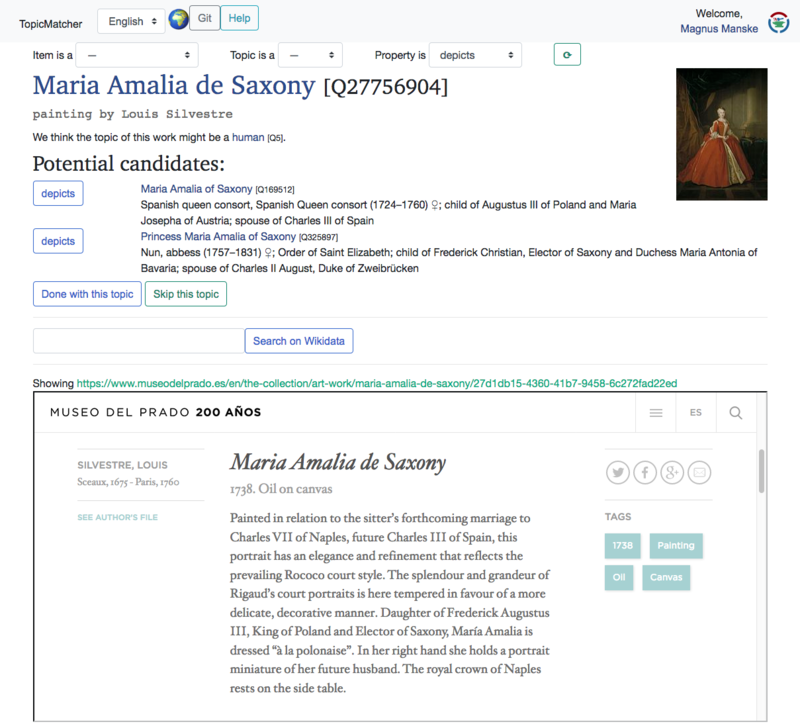 Assuming that a work of art has an image on Commons, as well as a museum and an inventory number, but no Wikidata item, such an item could be created automatically. This would pose little difficulty to code, but might generate duplicate items, where an items exists but does not have the inventory number set. Please let me know if this would be something to do. I’ll give you some numbers once the initial run is through. Disclaimer: I am the author of Listeria, and maintainer of ListeriaBot. In January 2016, User:Emijrp had an idea. Why not use that newfangled Listeria tool, a bot that generates lists based on Wikidata, and puts them on Wikipedia pages, to maintain a List of Women Linguists on English Wikipedia? It seemed that a noble cause had met with (at the time) cutting edge technology to provide useful information for both readers and editors (think: red links) on Wikipedia. The bot thus began its work, and continued dutifully for almost a year (until January 2, 2017). At that time, a community decision was made to deactivate ListeriaBot edits on the page, but to keep the list it had last generated, for manual curation. No matter what motivated that decision, it is interesting to evaluate the progress of the page in its “manual mode”. Since the bot was deactivated, 712 days have passed (at the time of writing, 2018-12-17). Edit frequency dropped from one edit every 1-2 days by the bot, to one edit every 18 days on average. In that time, the number of entries increased from 663 (last bot edit) to 673 (adding one entry every 71 days on average). The query (women, linguists, but no translators) used to generate the Listeria list now yields 1,673 entries. This means the list on English Wikipedia is now exactly 1,000 entries (or 148%) out of date. A similar lag for images and birth/death dates is to be expected. The manual editors kept the “Misc” section, which was used by ListeriaBot to group entries of unknown or “one-off” (not warranting their own section) nationalities. It appears that few, if any, have been moved into appropriate sections. It is unknown if manual edits to the list (example), the protection of which was given as a main reason to deactivate the bot, were propagated to the Wikidata item, or to the articles on Wikipedia where such exist (here, es and ca), or if they are destined to wither on the list page. The list on Wikipedia links to 462 biography pages (likely a slight overestimate) on English Wikipedia. However, there are 555 Wikidata items from the original query that have a sitelink to English Wikipedia. The list on Wikipedia thus fails to link to (at least) 93 women linguists that exist on the same site. One example of a missing entry would be Antonella Sorace, a Fellow of the Royal Society. She is, of course, linked from another, ListeriaBot-maintained page. Humans are vastly superior to machines in many respects. Curating lists is not necessarily one of them. Structured Data on Commons is approaching. 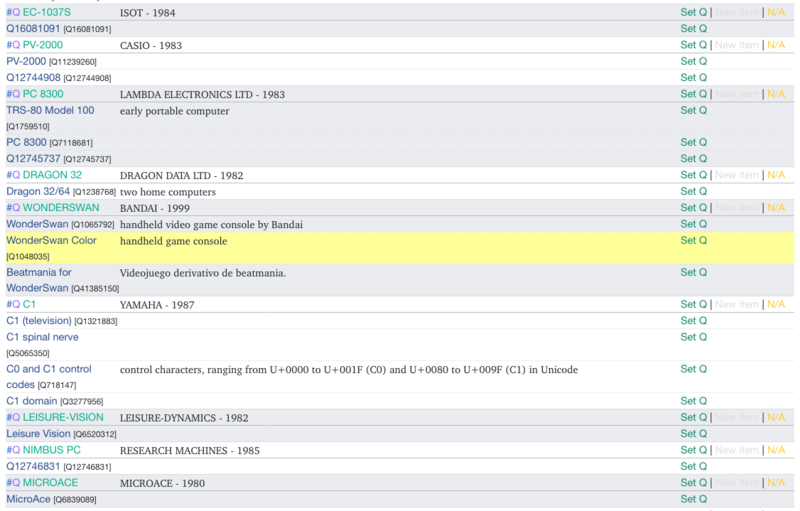 I have done a bit of work on converting Infoboxes into statements, that is, to generate structured data. But what about using it? What could that look like? It works for files on Commons that are used in a Wikidata item (so, ~2.8M files at the moment), though that could be expanded (e.g. scanning for templates with Qids, “depicts” in Structured data, etc.). The script then investigates the Wikidata item(s), and tries to find ways to get related Wikidata items with images. That could be simple things as “all items that have the same creator (and an image)”, but I also added a few bespoke ones. If the item is a taxon (e.g. the picture is of an animal), it finds the “taxon tree” by following the “parent taxon” property. It even follows branches, and constructs the longest path possible, to get as many taxon levels as possible (I stole that code from Reasonator). 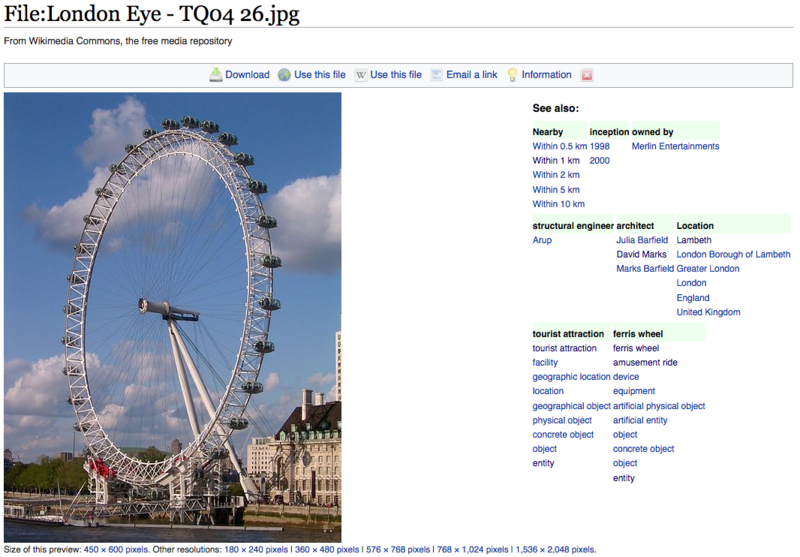 A similar thing happens for all P31 (“instance of”) values, where it follows the subclass hierarchy; the London Eye is “instance of:Ferris wheel”, so you get “Ferris wheel”, its super-class “amusement ride” etc. The same, again, for locations, all the way up to country. If the item has a coordinate, there are also a some location-based “nearby” results. Finally, some date fields (birthdays, creation dates) are harvested for the years. Each of these, if applicable, get their own section in a box floating on the right side of the image. 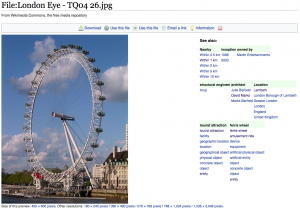 They link to a gallery-type SPARQL query result page, showing all items that match a constraint and have an image. So, if you look at The Night Watch on Commons, the associated Wikidata item has “Creator:Rembrandt”. 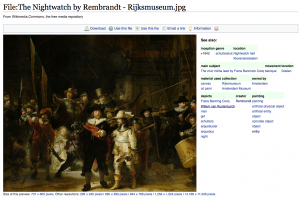 Therefore, you get a “Creator” section, with a “Rembrandt” link, that opens a page showing all Wikidata items with “Creator:Rembrandt” that have an image. In a similar fashion, there are links to “all items with inception year 1642”. Items with “movement”baroque”. You get the idea. Now, this is just a demo, and there are several issues with it. First, it uses Wikidata, as there is no Structured Data on Commons yet. That limits it to files used in Wikidata items, and to the property schema and tree structure used on Wikidata. Some links that are offered lead to ridiculously large queries (all items that are an instance of a subclass of “entity”, anyone? ), some that just return the same file you came from (because it is the only item with an image created by Painter X), and some that look useful but time out anyway. And, as it is, the way I query the APIs would likely not be sustainable for use by everyone by default. But then, this is what a single guy can hack in a few hours, using a “foreign” database that was never intended to make browsing files easy. Given these limitations, I think about what the community can do with a bespoke, for-purpose Structured Data, and some well-designed code, and I am very hopeful. Note: Please feel free to work with the JS code; it also contains my attempt to show the results in a dialog box on the File Page, but I couldn’t get it to look nice, so I keep using external links. Mix’n’match is one of my more popular tools. It contains a number of catalogs, each in turn containing hundreds or even millions of entries, that could (and often should!) have a corresponding Wikidata item. 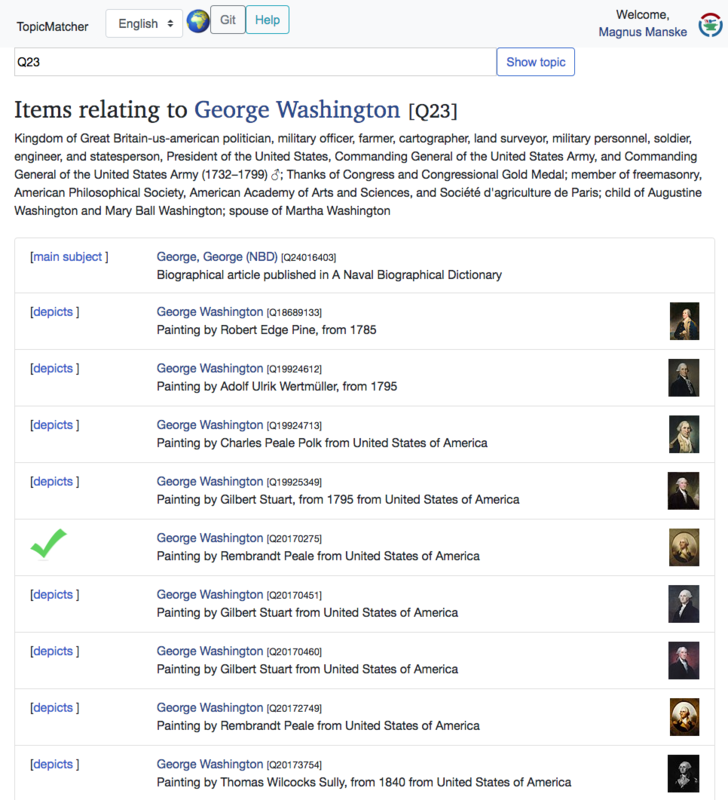 The tool offers various ways to make it easier to match an entry in a catalog to a Wikidata item. While the user-facing end of the tool does reasonably well, the back-end has become a bit of an issue. It is a bespoke, home-grown MySQL database that has changed a lot over the years to incorporate more (and more complex) metadata to go with the core data of the entries. Entries, birth and death dates, coordinates, third-party identifiers are all stored in separate, dedicated tables. So is full-text search, which is not exactly performant these days. The perhaps biggest issue, however, is the bottleneck in maintaining that data – myself. As the only person with write access to the database, all maintenance operations have to run through me. And even though I have added import functions for new catalogs, and run various automatic update and maintenance scripts on a regular basis, the simple task of updating an existing catalog depends on me, and it is rather tedious work. At the 2017 Wikimania in Montreal, I was approached by the WMF about Mix’n’match; the idea was that they would start their own version of it, in collaboration with some of the big providers of what I call catalogs. My recommendation to the WMF representative was to use Wikibase, the data management engine underlying Wikidata, as the back-end, to allow for a community-based maintenance of the catalogs, and use a task specific interface on top of that, to make the matching as easy as possible. As it happens with the WMF, a good idea vanished somewhere in the mills of bureaucracy, and was never heard from again. I am not a system administrator (or, let’s say, it is not the area where I traditionally shine), so setting up such a system myself was out of the question at that time. However, these days, there is a Docker image by the German chapter that incorporates MediaWiki, Wikibase, Elasticsearch, the Wikibase SPARQL service, and QuickStatements (so cool to see one of my own tools in there!) in a single package. Long story short, I set up a new Mix’n’match using Wikibase ad the back-end. The interface is similar to the current Mix’n’match (I’ll call it V1, and the new one V2), but a complete re-write. It does not support all of the V1 functionality – yet. I have set up a single catalog in V2 for testing, one that is also in V1. Basic functionality in V2 is complete, meaning you can match (and unmatch) entries in both Mix’n’match and Wikidata. Scripts can import matches from Wikidata, and do (preliminary) auto-matches of entries to Wikidata, which need to be confirmed by a user. This, in principle, is similar to V1. There are a few interface perks in V2. There can be more than one automatic match for an entry, and they are all shown as a list; one can set the correct one with a single click. And manually setting a match will open a full-text Wikidata search drop-down inline, often sparing one the need to search on Wikidata and then copying the QID to Mix’n’match. 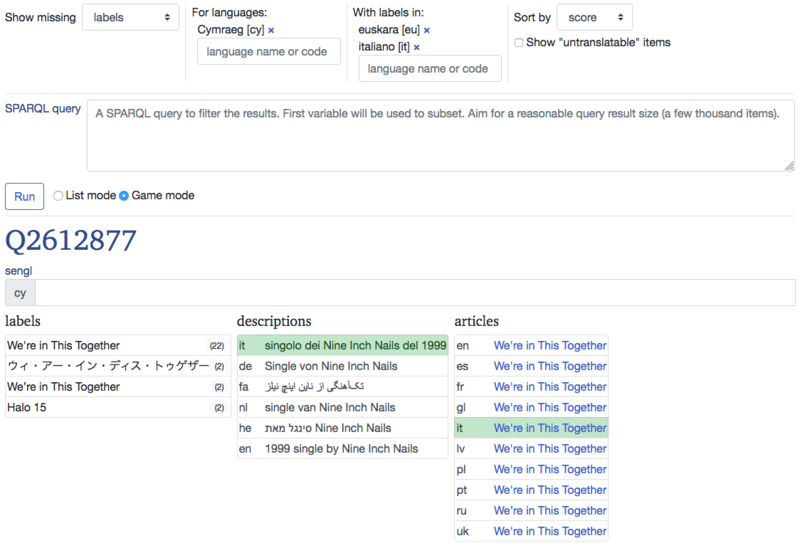 Also, the new auto-matcher takes the type of the entry (if any) into account; given a type Qx, only Wikidata items with name matches that are either “instance of” (P31) Qx (or one of the subclasses of Qx), or items with name matches but without P31 are used as matches; that should improve auto-matching quality. But the real “killer app” lies in the fact that everything is stored in Wikibase items. 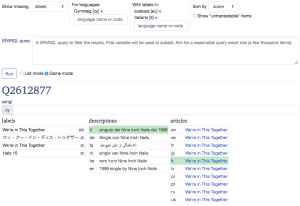 All of Mix’n’match can be edited directly in MediaWiki, just like Wikidata. Everything can be queried via SPARQL, just like Wikidata. Mass edits can be done via QuickStatements, just like… well, you get the idea. But users will just see the task-specific interface, hiding all that complexity, unless they really want to peek under the hood. So far with the theory; sadly, I have run into some real-world issues that I do not know how to fix on my own (or do not have the time and bandwidth to figure out; same effect). First, as I know from bitter experience, MediaWiki installations attract spammers. Because I really don’t have time to clean up after spammers on this one, I have locked account creation and editing; that means only I can run QuickStatements on this Wiki (let me know your Wikidata user name and email, and I’ll create an account for you, if you are interested!). Of course, this kind of defeats the purpose of having the community maintain the back-end, but what can I do? Since the WMF has bowed out in silence, the wiki isn’t using the WMF single sign-on. The OAuth extension, which was originally developed for that specific purpose, ironically doesn’t work for MediaWiki as a client. None of the above are problems with Mix’n’match V2 in principal, but rather engineering issues to fix. Help would be most welcome. Syncing back to Wikidata (probably easy to do). Importing of new catalogs, and updating of existing ones. I am thinking about a standardized interchange format, so I can convert from various input formats (CSV files, auto-scrapers, MARC 21, SPARQL interfaces, MediaWiki installations, etc.). Meta-data handling. I am thinking of a generic method of storing Wikidata property Px ID and a corresponding value as Wikibase statements, possibly with a reference for the source. That would allow most flexibility for storage, matching, and import into Wikidata. I would very much like to hear what you think about this approach, and this implementation. I would like to go ahead with it, unless there are principal concerns. V1 and V2 would run in parallel, at least for the time being. Once V2 has more functionality, I would import new catalogs into V2 rather than V1. 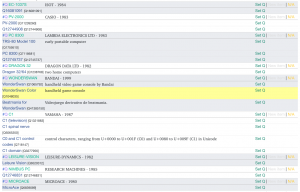 Suggestions for test catalogs (maybe something with interesting metadata) are most welcome. And every bit of technical advice, or better hands-on help, would be greatly appreciated. And if the WMF or WMDE want to join in, or take over, let’s talk! before the importScript invocation, it will not check automatically, but wait for you to click the “Referee” link in the toolbox sidebar. However, in manual, it will force a check (might take a few seconds) in case there are no reference candidates; the toolbar link will remain highlighted while the check is running. I made a brief video demonstrating the interface. Enjoy. Addendum: Forgot to mention that the tool does not work on certain instances (P31) of items, namely “taxon” and “scholarly article”. This is to keep the load on the scraper low, plus these types are special cases and would likely profit more from dedicated scraper systems. As a first attempt, I queried all subspecies items from Wikidata, searched for scientific publications, and added them to TopicMatcher. That worked reasonably well, but didn’t yield a lot of results, and they need to be human-confirmed. So I came at the problem the other way: Start with a scientific publication, try to find a taxon (species etc.) name, and them add the “main subject” match. Luckily, many such publications put taxon names in () in the title. Once I have the text in between, I can query P225 for an exact match (excluding cases where there are more than one! ), and then add “main subject” directly to the paper item, without having to confirm it by a user. I am aware that this will cause a few wrong matches, but I imagine those are few and far between, can be easily corrected when found, and are dwarfed by the usefulness of having publications annotated this way. There are millions of publications to check, so this is running on a cronjob, slowly going through all the scientific publications on Wikidata. I find quite a few topic in () that are not taxa, or have some issue with the taxon name; I am recording those, to run some analysis (and maybe other, advanced auto-matching) at a later date. So far, I see mostly disease names, which seem to be precise enough to match, in many cases. Someone suggested to use Mix’n’match sets to find e.g. chemical substances in titles that way, but this requires both “common name” and ID to be present in the title for a sufficient degree of reliability, which is rarely the case. Some edits have been made for E numbers, though. I have since started a similar mechanism running directly off Wikidata (initial results). Then, I discovered some special cases of publications that lend themselves to automated matching, especially obituaries, as they often contain name, birth, and death date of a person, which is precise enough to automatically set the “main subject” property. For cases where there is no match found, I add them to TopicMatcher, for manual resolution. I have also added “instance of:erratum” to ~8,000 papers indicating this from the title. This might be better places in “genre”, but at least we have a better handle on those now. Both errata and obituaries will run regularly, to update any new publications accordingly. As always, I am happy to get more ideas to deal with this vast realm of publications versus topic. Wikidata already contains a lot of information about topics – people, places, concepts etc. It also contains topics that have a topic, e.g., a painting of a person, a biographical article about someone, a scientific publication about a species. 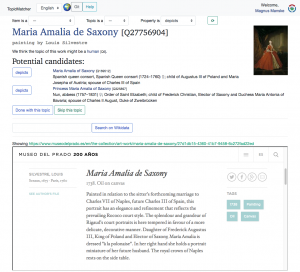 Ideally, Wikidata also describes the connection between the work and the subject. Such connections can be tremendously useful in many contexts, including GLAM and scientific research. This kind of work can generally not be done by bots, as this would require machine-readable, reliable source data to begin with. However, manually finding items about works, then finding the matching item on Wikidata is somewhat tedious. Thus, I give you TopicMatcher! In a nutshell, I prepare a list of Wikidata items that are about creative works – paintings, biographical articles, books, scientific publications. Then, I try to guesstimate what Wikidata item they are (mainly) about. Finally, you can get one of these “work items” and their potential subject, with buttons to connect them. At the moment, I have biographical articles looking for a “main subject”, and paintings lacking a “depicts” statement. That comes to a total of 13,531 “work items”, with 54,690 potential matches. The idea of the page preview is to find more information about the work, which will allow you to determine the correct match. If there are no suggested subjects in the database, a search is performed automatically, in case new items have been created since the last update. Once you are done with the item, you can click “Done” (which marks the work item as finished, so it is not shown again), or “Skip”, to keep the item in the pool. Either way, you will get another random item; the reward for good work is more work…. At the top of the page are some filtering options, if you prefer to work on a specific subset of work items. The options are a bit limited for now, but should improve when the database grows to encompass new types of works and subjects. Alternatively, you can also look for potential works that cover a specific subject. George Washington is quite popular. I have chosen the current candidates because they are computationally cheap and reasonably accurate to generate. However, I hope to expand to more work and subject areas over time. Scientific articles that describe species come to mind, but the queries to generate candidate matches are quite slow. If you have ideas for queries, or just work/subject areas, or even some candidate lists, I would be happy to incorporate those into the tool!